As the Federal Reserve’s two-day meeting approaches (slated for Tuesday and Wednesday), equity prices have moved irregularly lower during the past week or so with wide intraday swings occurring during most trading sessions. In turn, these heightened intraday fluxuations have lifted the CBOE S&P 500 Volatility Index (VIX) above key downtrend resistance at the 14.50 level. With weekly technical oscillators on the VIX currently rising in favor of increased volatility, the real question is: By how much? Clearly, investors are now looking for Fed Chairman Ben Bernanke to address the question of “tapering” the amount of its monthly asset purchases. If the view of the FOMC is that the domestic economy is expected to show steady improvement accompanied by a better employment climate, the beginning of a “taper” could emerge on the “sooner-than-expected” side of the ledger sheet. Such a scenario could launch the VIX to higher levels more quickly than expected. It would also suggests that a renewed round of equity “profit taking” could be triggered combined with an increase in bond dumping. On the other hand, if the Fed’s post-meeting announcement is more tempered, the rise in the VIX could be restrained. 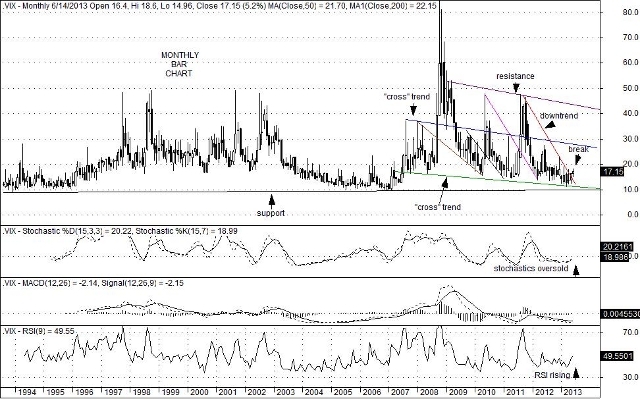 In any event, the current technical set-up on the VIX suggests that it is likely to move higher in coming months. The incentive to “lock in” profits prior to the end of Q2 is clearly a factor. The direction of the U.S. dollar index (DXY), the path of commodity prices, a monitoring of Japanese markets as well as to economic conditions in Europe and China are part of the equation. Most eyes, however, will be looking toward Q2 earnings which begin to be announced in three weeks as an important indication of how U.S. businesses are currently faring. Weekly charts nevertheless suggest that even a “tempered” outlook by the Fed could result in a rise toward key resistance at 28 on the VIX accompanied by an extension to the current correction in equity prices. On the other hand, an unexpected or unforeseen event of a global nature could rocket the VIX above the 28 level to a possible test of key trend line resistance currently sitting at 43. This type of move, of course, would likely be a byproduct of a more violent downturn in equity prices. For now, the “tempered on the taper” scenario appears to be the best bet. This entry was posted on Thursday, June 20th, 2013 at 11:32 am	and is filed under CBOE Volatility Index (VIX). You can follow any responses to this entry through the RSS 2.0 feed. You can leave a response, or trackback from your own site.